While every business needs equipment that is reliable and efficient to boost productivity, they also consider those that would reduce their operation costs and for this they can refer to this Samsung Monochrome Multifunctional Printers review. This presents 2 new all-in-one printers that offer the ease of use in printing, copying, scanning and faxing. They deliver high performance speeds while providing a solution to overhead expenses, in general. In addition to this, they reduce environmental impact with their eco-friendly features. To begin with, you have the option of choosing the toners you would like to utilize. There is a standard type that yields 5000 pages while an extra high yield of 10,000 pages offers a lower cost per page and fewer replacements. For high volume printing requirements, you can choose to upgrade to a 520 cassette from the standard 300 sheet capacity. This gives continuous printing without the need of reloading, from time to time. Moreover, these printers are capable of rapid speeds, even from their first page. They deliver performance that is required in every workplace. They, also, include the brand’s exclusive AnyWeb Print software that let you save and print content from different web pages. This comes useful in big projects. Samsung SCX4833FD is a monochrome laser multifunctional device that can print, copy, scan and fax. It measures 16.7” W x 15.04” D x 16.02” H and weighs 31.68 lbs. Its standard memory of 128 MB is capable of expanding up to a maximum of 384 MB. It has a print and copy speed of 31 pages per minute for size A4 and 33 pages per minute for letter size. Its first page prints, fast, in 6.5 seconds while it copies its first page in 12 seconds. It has a print and copy resolution of 1200 x 1200 dpi and has a monthly duty cycle of 50,000 pages. It is capable of duplex printing that allows you to cut down on printing costs and paper use, up to 50%. Its other copy features include allowing 99 multi copies, id copies, copies of 2-in-1and 4-in-1, poster copies, clone copies, collation copies and auto-fit. It can enlarge up to 400% and can reduce down to 25%. It has an enhanced scan resolution of 4800 x 4800 dpi and can scan directly to PC, email and USB memory. It is compatible with Windows and Linux operating systems. It can fax with a resolution of the ff: 203 x 98 dpi for fine; 203 x 196 dpi for photo; 300 x 300 dpi for super fine; and 200 x 200 dpi for color. Its fax memory of 5MB enables fax of 445 pages. It has fax features of Auto Redial, Redial of Last Number, Fax Forwarding, Multi-send, Delayed Send, Auto Reduction, On hook dial and 209 location broadcasting. It has large capacity tray of 250 sheets and a multipurpose tray of 50 sheets while its output tray can hold up to 150 sheets. It supports media from size 3” x 5” to 8.5” x 14” and media forms like plain paper, thick paper, thin paper, cotton paper, color paper, preprinted paper, recycled paper, transparencies, labels, envelopes and archives. Its automatic document feeder (ADF) allows you to leave printing unattended so you can focus on other tasks. Its noise level while printing is less than 52dBA, so, it doesn’t add to unnecessary noise in the workplace. Samsung SCX5737FW is a monochrome laser all-in-one device that functions as a printer, copier, scanner and fax machine. It measures 18.46” W x 17.24” D x 17.6” H and weighs 36.49 lbs. It makes use of a 4.3” touchscreen LCD display that gives easy navigation of printer menu. It prints and copies at 35 pages per minute for an A4 size and 37 pages per minute for letter size. It has the same print and copy resolution of 1200 x 1200 dpi. Its first page prints at 6 seconds while it copies its first page in 10 seconds. It has built-in duplexing feature that saves on time of printing 2 sides of a paper at one time, which saves on paper and costs of printing. 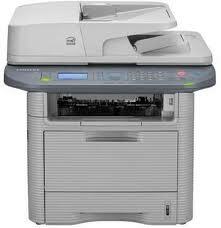 It has the same copy features as the SCX4833 which allows 99 multi copies, id copies, copies of 2-in-1 and 4-in-1, poster copies, clone copies, collation copies, auto-fit, reduction down to 25% and enlargement up to 200%. It has a high scan resolution of 4800 x 4800 dpi which allows you to scan directly to a PC, email, USB memory, FTP, SMB and Internal Flash Drive. Its fax memory of 50MB allows a maximum of 4000 pages. It has a 200 location speed dial plus Auto Redial, Redial of Last Number, Fax Forwarding, Multi-send, Delayed Send and Auto Reduction. Its paper handling features include a large input capacity tray of 250 sheets, a multipurpose tray of 50 sheets, an output capacity tray of 150 sheets, an automatic document feeder of 50 sheets with a width of 5.6” x 8.5” up to 5.8” x 14”. It supports media sizes of 3” x 5” to 8.5” x 14” and the following media forms: plain paper, thick paper, thin paper, cotton paper, color paper, preprinted paper, recycled paper, transparencies, labels, envelopes and archives. It is compatible with Windows and Linux operating systems. It has USB, Ethernet and wireless connectivity that allows printer sharing among other computer users within the network. With its noise level of less than 52dB, it is suitable for any office. Samsung SCX4833FD and SCX5737FW are 2 new multifunctional printers that give the ease of printing, copying, scanning and faxing. They are packed with features starting from their high yield cartridges that allow you to print a lot while saving on a lower cost per page. These cartridges, likewise, let them deliver rapid print speeds from the very first page. Flexible paper handling, like larger capacity trays, allows continuous workflow and less paper reloading. Auto duplexing capability saves on both time and paper since you have to print a 2-sided page, at just one time. With less use of consumables like paper, it contributes in helping save the environment. Another important feature, such as an automatic document feeder, gives convenience of use since there is no need to feed paper into the printer. You can just leave this to attend to other work at the office. This, further, enhances productivity. Now, businesses can save on operation costs while meeting their target productivity and this is made possible with the devices presented in the Samsung Monochrome Multifunctional Printers review. Simply click here to return to Best All in One Printers.